In the article, we look at the interactions between historical events and fashion about 100 years ago. As the world entered the 20th century, society changed very little. Edwardian society was, more or less, the same as society in the Victorian Era. Society functioned in the way older members of the aristocracy approved of because in order to work your way up the social ladder, they were the ones that had to accept you. It was a society full of rules and social hierarchy in which an upper class woman was seen largely as a decorative object. But not long into the century, things began to change drastically. These changes can be seen through rapidly changing women’s fashions of the time. At the end of the Victorian Age, women became increasingly unsatisfied with their roles in the world. They sought out independence and a voice in the political world. Many middle and upper class women began to organize themselves and fight for suffrage. As some women were fighting for their rights in the streets, others began fighting for their rights in the workplace. More job opportunities were available to women at this time. They started to become secretaries, a role previously held by men. With typing skills, a woman could get a job in an office. This was a socially acceptable way to earn a living with better hours and pay than they could get as a maid. Because of this, many women and men started leaving their positions in service to the aristocracy for the cities and office jobs. This marked the beginning of the end of the aristocracy’s way of life. As more women began marching, picketing, and surviving in a male dominated workplace, women’s clothing began to change. Their dresses became simpler, less fussy. Their skirts lost a lot of their fullness and rose up off the ground, becoming much more practical. Their clothes also often featured masculine details inspired by men’s suits creating a more powerful, no nonsense appearance. In fact, throughout history, women have worn masculine inspired clothing to emphasis their strength. This was the case with the broad shouldered, sturdy clothing worn as women took care of the home front in WWII and with the shoulder-padded, suit inspired clothing of women climbing the corporate ladder in the 1980s. Contrary to all this forward thinking clothing, was the hobble skirt. A hobble skirt was a long, tight skirt with no slit which made walking difficult. Some women were literally hobbling themselves by wearing them. The fashion didn’t last long. World War I further broke down the existing social structure. People of all classes were stepping up for the war effort. Whether they got jobs or volunteered, women were more often getting out of the house. Men of all classes fought alongside each other. These men realized that the enemy didn’t care what class they belonged to; neither did the Spanish Flu, which killed an enormous number of people just as the war was ending. During the war, changes in fashion were quite straight forward. They were a direct result of the war. Many men, and some women, wore uniforms. Many civilian clothes featured military inspired details to give a sort of patriotic support. Upper class women who volunteered for the war effort wore more practical, work appropriate clothes day to day. As the war ended, the survivors returned home wounded - both physically and mentally. They may have realized that there were things in life more important than maintaining a strict hierarchy in society. Those social conventions soon broke down. In the 1920s, society began to be led not by the older aristocracy, but by the lucky upper-class young people who had survived the war. Their world views, no doubt, had been completely changed. The feeling that life ought to be lived to the fullest was abundant. They felt that it was no time to hold on to the strict rules of society. It was time to have fun. And they did. These young people went out to nightclubs, danced, and did drugs. Because of these new venues to party, social classes began mixing in a way that hadn’t really happened before. Society’s relaxation was clearly shown through popular fashion. Women’s clothing became less complicated. Again, this largely came down to practicality; many women no longer had servants helping them to take care of their homes. Women’s fashion needed to be easier to take care of and possible to get in to without the help of a maid. Clothing also became less confining with girdles and brassieres replacing corsets and skirts becoming shorter. Skirts became so scandalously short that several American states attempted to create laws to control their length. The laws didn’t work and skirts were just below the knee by the end of the decade. 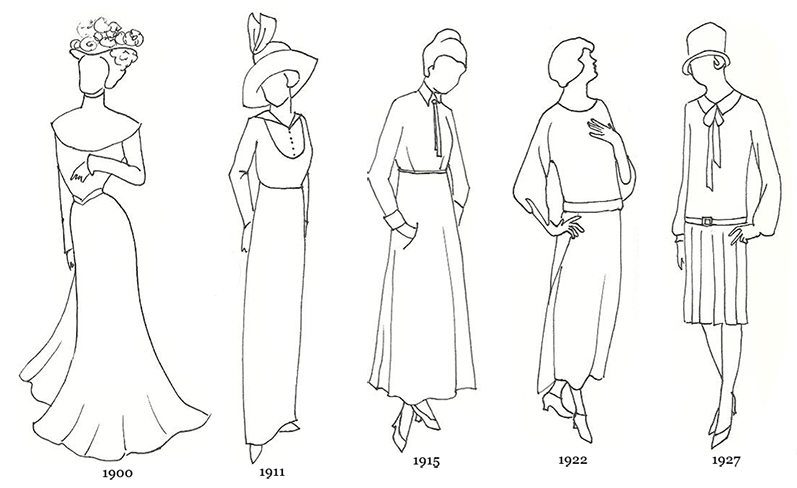 Women’s clothing in the 1920s began to further resemble menswear. Women deemphasized their curvy figures by wearing clothes that flattened their busts and straightened their hips. Cutting their hair short was the finishing touch to this popular new androgynous look. This may have been a 1920s version of what occurred with the suffragettes in the 1910s. By the end of the 1920s, the struggles of the suffragettes finally paid off as women in the US and UK could vote. The male-inspired clothing they wore may have been a reflection of the newfound power and independence they felt. As the century wore on, from the longer skirts in the conservative 1930s to the mod and hippie looks of the 1960s, women’s clothing continued to evolve based on their place in society and vice versa. Where we are in society always has, and always will, dictate what we wear. How do you think World War I affected society? The author has an MFA in Theatre Design from The Ohio State University with a concentration in scenic and costume design. She is also the owner of porterphotorepair.com, a photo restoration service which specializes in repairing antique photographs. For more great history articles by the likes of Corinne, join us by clicking here. James Laver, Amy de la Haye & Andrew Tucker. Costume and Fashion: A Concise History. New York: Thames & Hudson, 2002.
thePresent Day. New York, NY: Checkmark Books, 2000.